at the end of the street, rounding off the enterprise, are two big corner gardens, each ripe with potential. which is to say, each one is a derelict wreck. one is a bramble patch with a Defunct Car in the middle (I ask you); t’other, better yet, paved solid: a challenge. well, one challenge at a time: forward! into the bramble patch… the garden of Hope, Roger and the three boys, the greatest kids in the world, all then under six, and fascinated fans of the project. and thus are legends born. 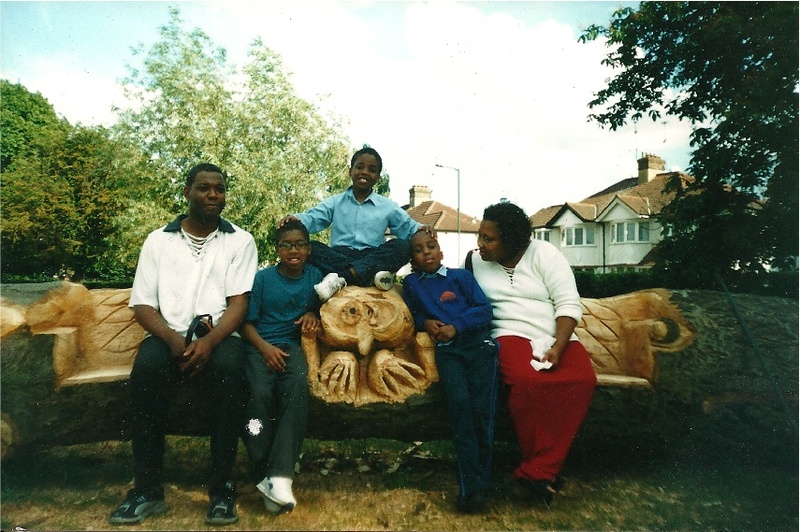 I got one of my Rare Good Photos of all the family together in the park, seated all together on our then-brand-new Owl Bench. I was so proud that I had it enlarged and framed to give to them: a Smile in Time. where does one start? seize the nettle, get the ball rolling, and all will follow… perhaps. USE WHAT’S ALREADY THERE: build a frame to lift up the climbing rose that has climbed right into a heap on the ground. once up, right there beside the front door, we build a good solid front bench. the carpentry skills are up a notch, now, the tools are arranged in their wooden boxes following me around in the trusty rusty wheelbarrow. scaffolding planks, sturdy and sizeable, are not too hard to salvage. once the bench was made, we’d all sit out there in the evenings with cups of tea and fish and chips: a Neighbourhood. in front of the bench, brick edging formalised the flower bed. climbers were installed to mask the fence. trellis and roses masked the bins. an arch appeared over the gate, a clematis climbed up it. dominated by the tasteful centrepiece of a large derelict car. Roger had pushed it into the garden when the local council tightened up the parking regulations and he had had to get it off the street. a Jag, or something similar, dear to his heart, meaning we couldn’t just junk the wretched thing. it was his Vintage Treasure. psychology became a part of our own little urban renewal project: finally, a bunch of us pushed it around the back, hid it in the rear garden, out of public view (some time after that, he finally did dump it completely). I received hearty thanks from the general population for that one. having achieved a large clear space to work with, we moved into the by now familiar harmony of curving paths of salvaged brick, around plots of hardy perennials. these became established colonies. this worked well. over later years, I was able to return, lift out some plants to transplant elsewhere, and get them established there as well. and from there onwards. trim, prune, transplant: this is all becoming a reflex.